It’s hard to believe that another school year will be over in one week! There is a lot to be done in my classroom and I needed to wear something that wouldn’t show dirt and dust as I cleaned, sorted, rearranged, and organized my classroom. Pink Splendid shirt from Nordstrom Rack, last seen here. I love Splendid! The fit and quality of their clothing is awesome. It is a little pricey, but in my opinion it is well worth your money. I have had this shirt for a couple of years and it still looks new! Dark Skinny Jeans from Forever 21. When I bought these jeans, I had no idea how much I would wear them or that they would last so many years. I need to go to a F21 and try to find another pair, these are slowly starting to fade and I want another dark pair of skinnies. I have a similar pair that are Hudson, but I like the fit and look of these better! 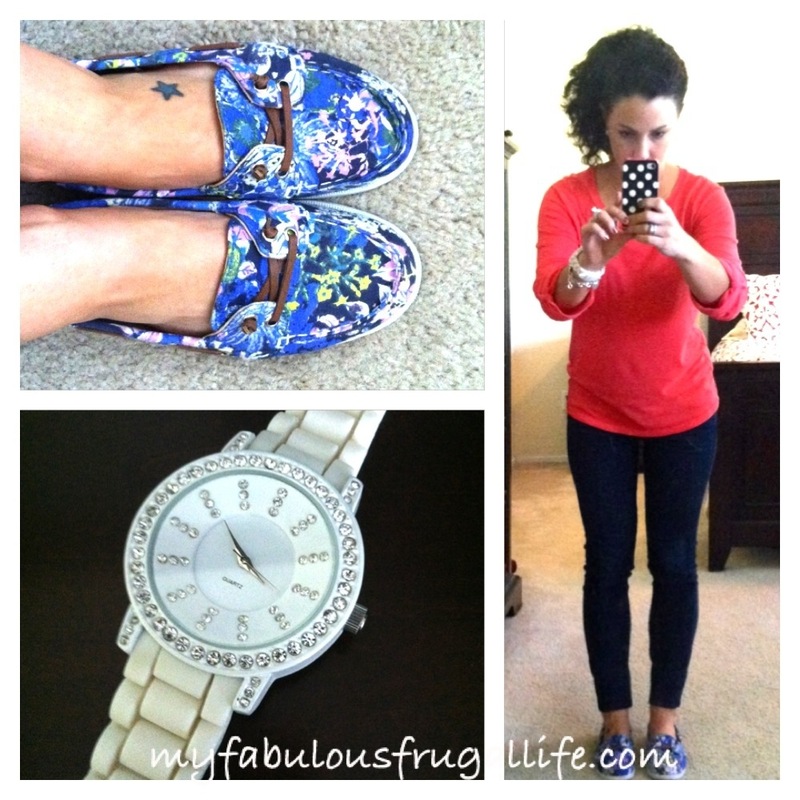 Floral Boat shoes $8.99 from Old Navy, last seen here. I think these are the cutest shoes! I also bought them in pink. They look great with shorts, too! White rhinestone boyfriend watch from Target. I think this could possibly be my best find from Target. I have seen similar watches for $200 or more dollars and I only paid $9!